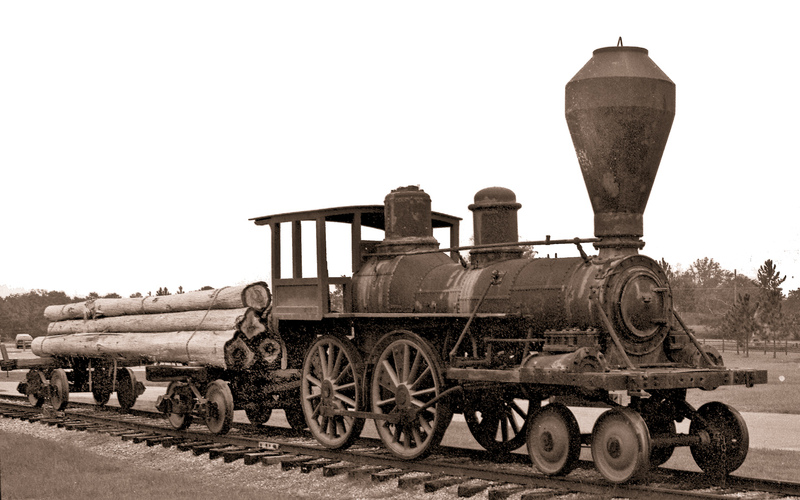 The Bache Brothers Lumber Co. operated a small saw mill about five miles south west of Live Oak, Florida on the old Live Oak & Gulf Railroad, a shortline that once ran from Live Oak to Luraville. 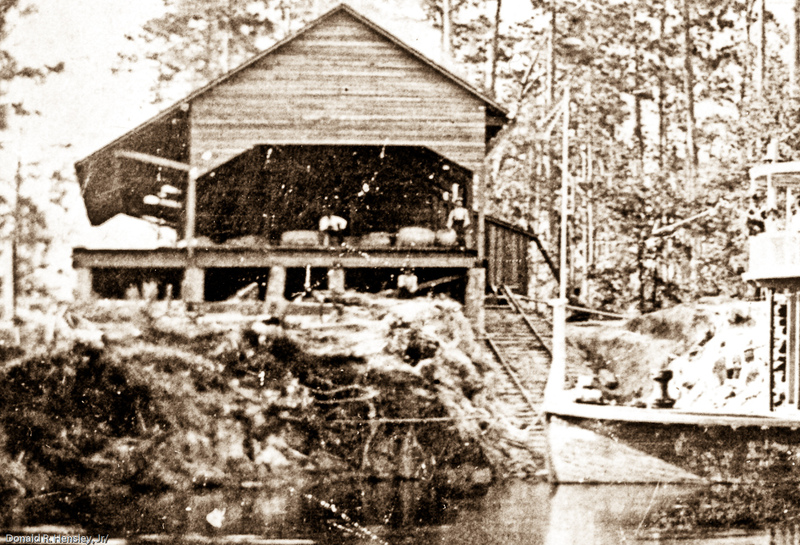 After logging out their Suwanee County lands, they expanded to their lands in Lafayette County, which could only be reached by barge from the LO&G's port at Peek. 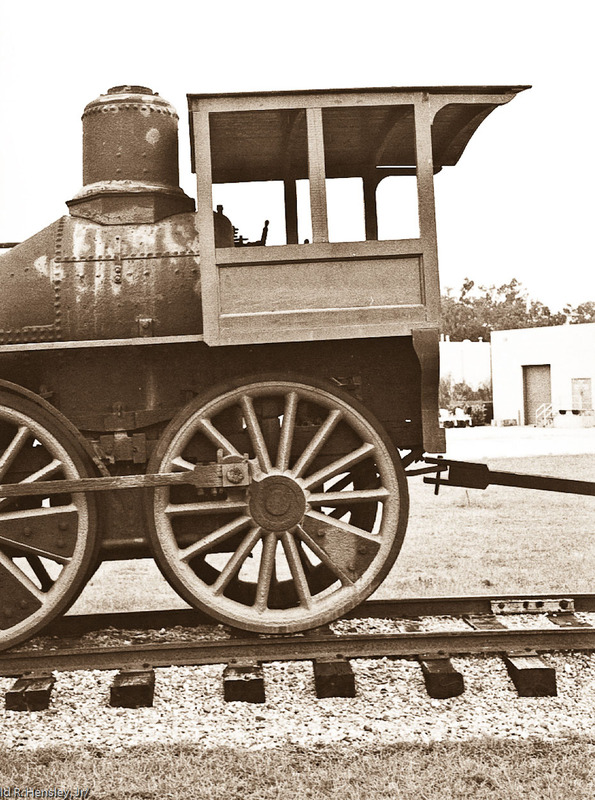 While transporting the locomotive across the river in 1906, the load became unbalanced and capsized the barge, dumping the engine into the Suwanee, where she stayed for 73 years. A local Luraville man, Jim Lancaster, grew up admiring the engine during periods of low water and promised himself that he would pull the engine up, which he did in 1979. 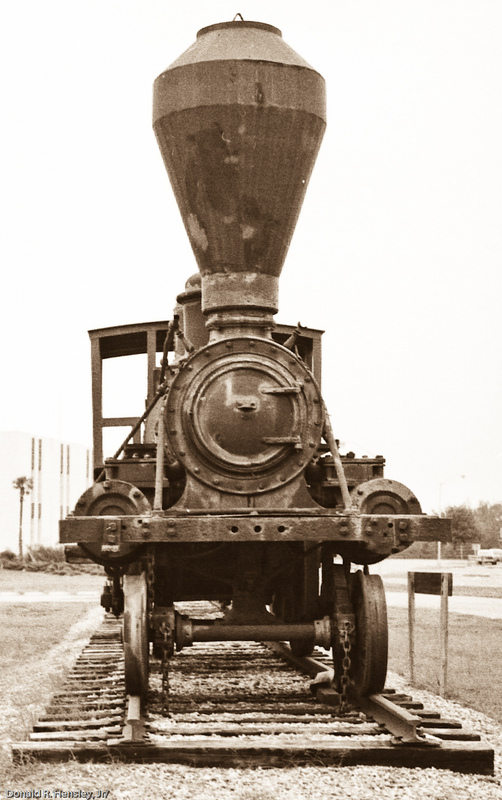 However the costs were too much for him and he had to sell the engine to Jim Goyke of the Jacksonville crane company which pulled her from the river, who then donated it to the State of Florida in 1982. The late Earnest A. 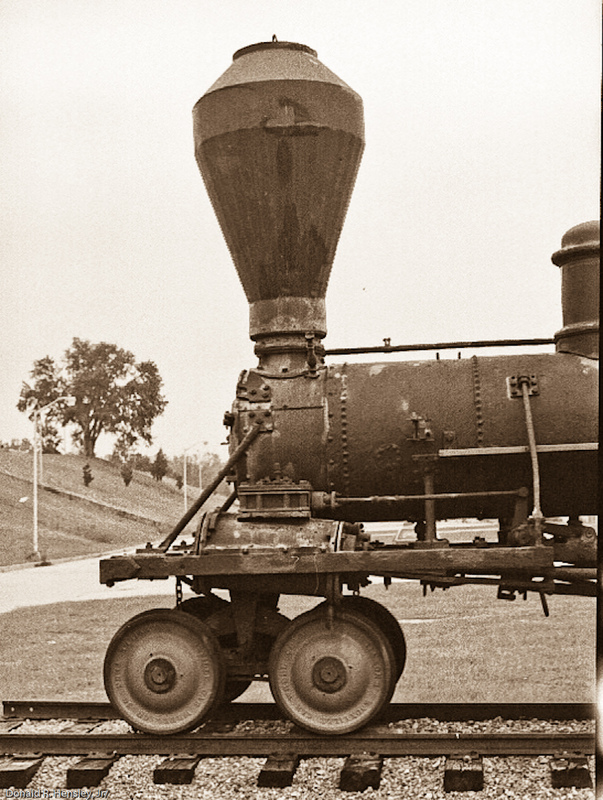 "Frog" Smith, a deep south logging railroad lore master, states that the engine is a Danforth Cooke because of the weight counter balanced reverse links. He also states that the late O. M. Cross of Dowling Park was on the crew that was transporting her in 1906. 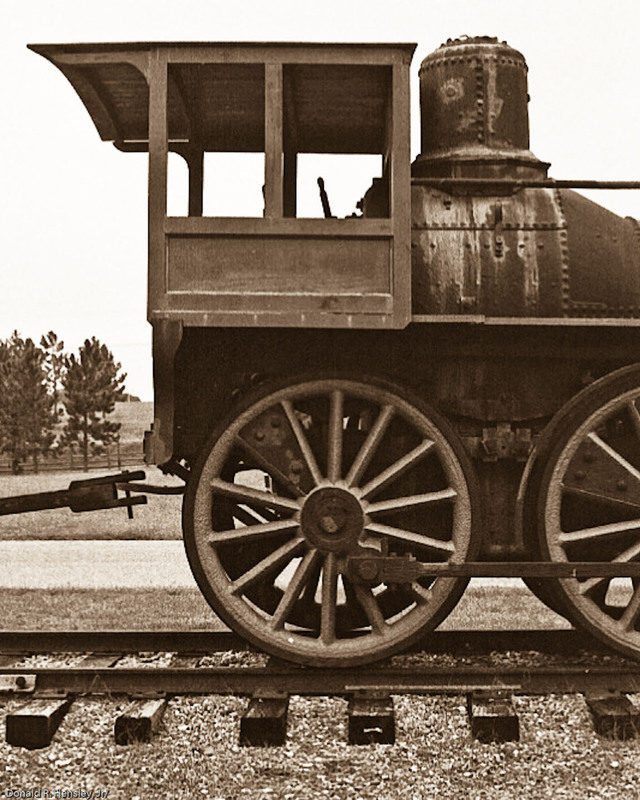 Cross would later work for over 30 years as a blacksmith for the Dowling Lumber Company. The engine is said to weigh ten tons and have around 60 inch drivers. 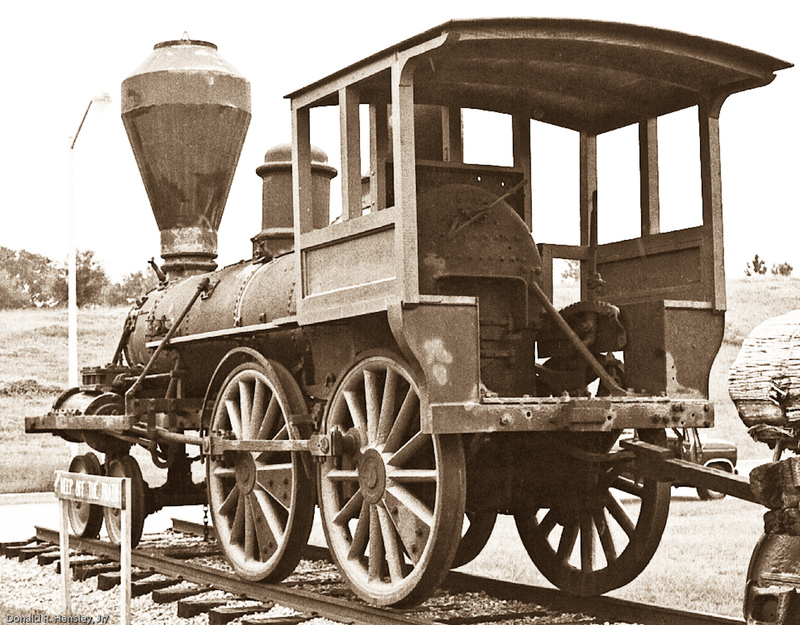 The style seems to suggest a locomotive of the late 1840's, though it has been rebuilt several times. 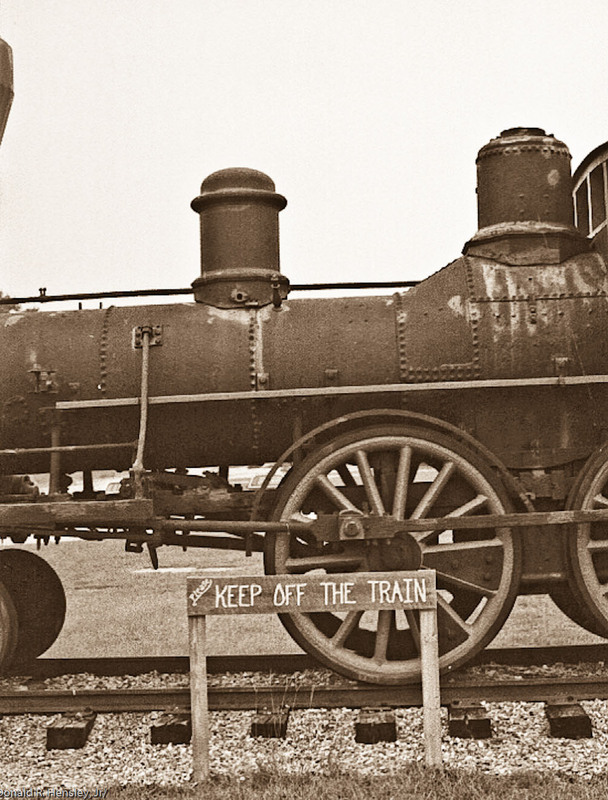 The outside frame probably extended all the way to the back of the locomotive when built. 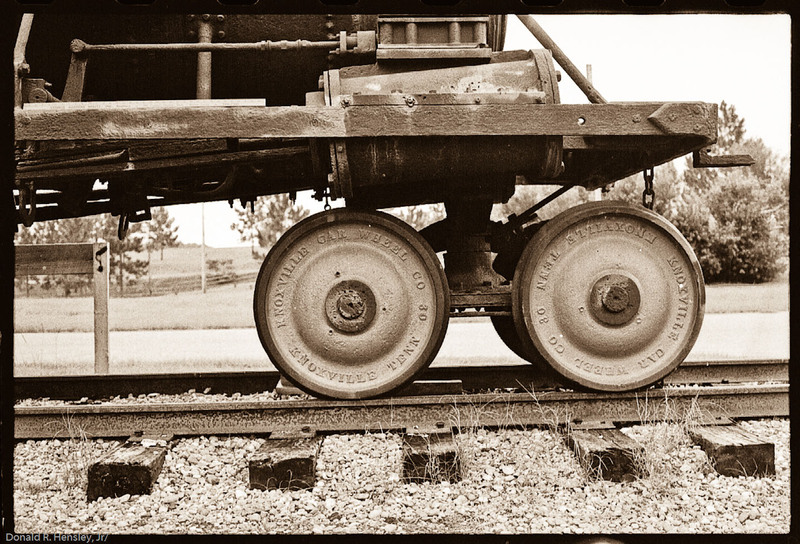 I think the Link-Motion used here is not the same when the locomotive was built, some improvements may have been made to simplify the original Link-Motion. 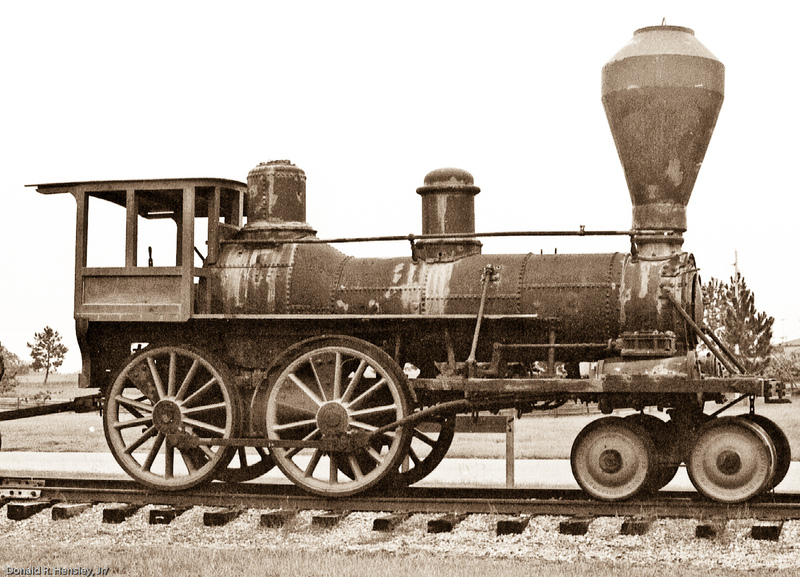 While Frog Smith says it was a Danforth Cooke, he also says it is a sister of the Texas in the Cyclorama in Atlanta, which is a Rogers, a locomotive builder which also used counterweighted reverse links. 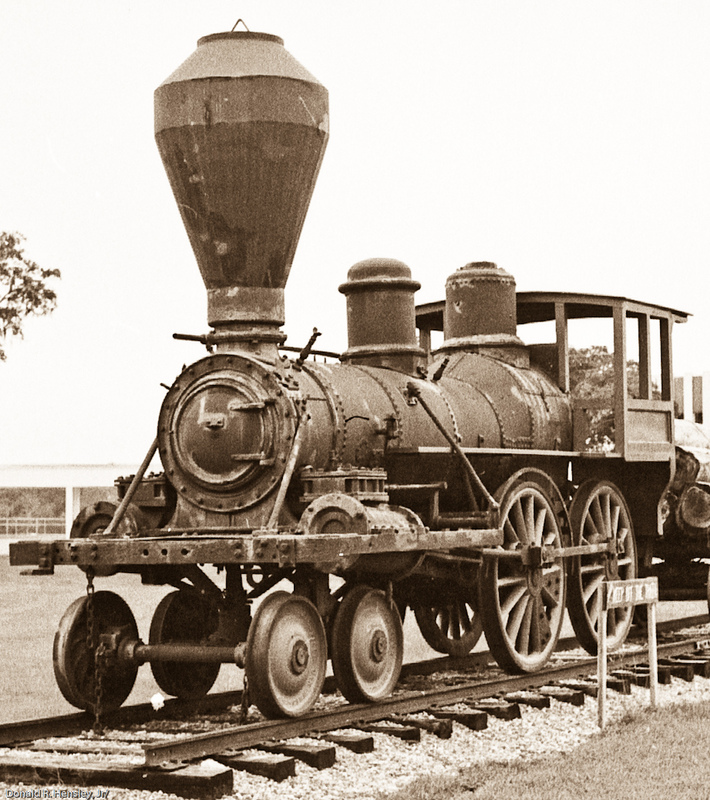 The Link-Motion here matches the link motion used by Rogers in the late 1860's, which would suggest a rebuilding. 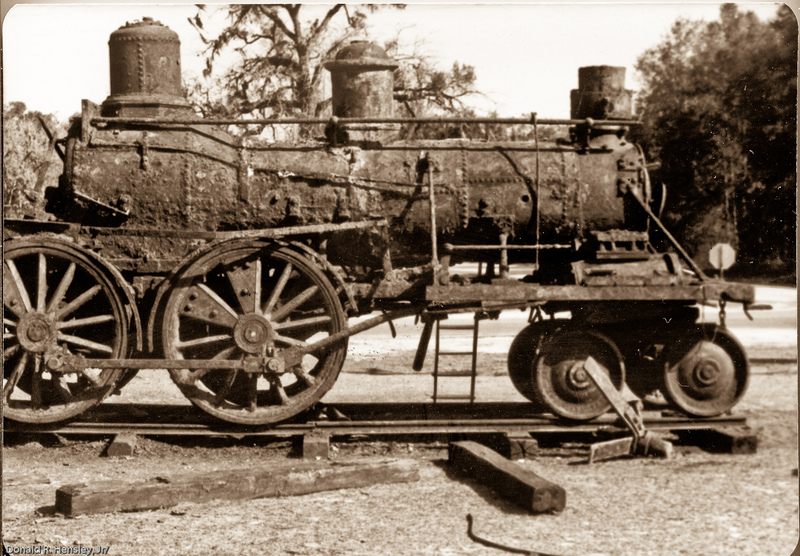 Another factor favoring a Rogers is the local major railroad (the Pensacola & Georgia / Florida Central & Peninsular), favored Rogers and would have provided old wornout engines for sale to local sawmills. 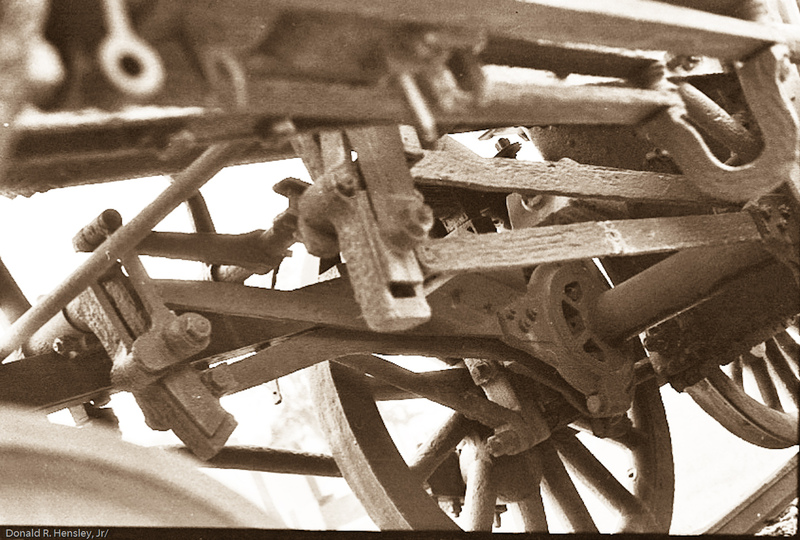 A photo taken by EA Frog Smith in 1980 at Luraville. This is how the engine actually looked after her ordeal. Peek on the Suwanee River, the terminus of the Live Oak & Gulf. Note the track were box cars were lowered to the river for loading by the steamboats. 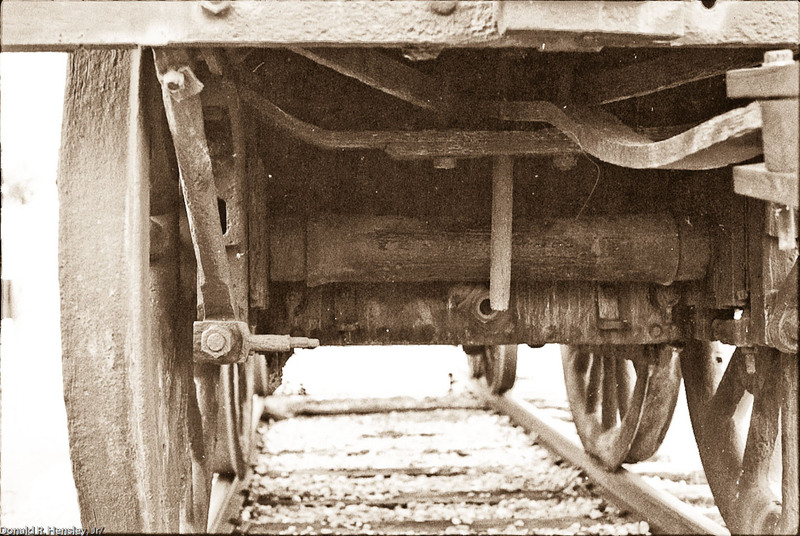 The locomotive would have been lowered using this track.